Before you begin working your way to foreign language fluency, it helps to understand the culture behind the language you’re learning. After all, language exists to help a group of people express their ideas and beliefs. Spain is an old country with a rich history and culture. As you begin your Spanish language program, gaining a strong grasp on this history, the values, and the etiquette will help you rapidly achieve success. In particular, Spanish markets provide a wealth of entertainment as well as insight to traditional, handmade items found throughout Latin America and Spain. Latin America offers a wide variety of decorative, handmade items for visitors interested in handicrafts or unique souvenirs. Artisenas create folk art featuring symbolic designs, and jewelry made with high quality silver from area mines. A large number of surviving indigenous groups and a profusion of folk artists in Latin America, constitute a huge marketplace for traditional designs as well as novel and modern variations. Celebrations such as “Día de los Muertos” (“Day of the Dead”), promote the production of Halloween type arts and crafts, such as papier-mâché skulls, skeletons, and masks. These celebrations originated from ancient traditions during pre-Columbian times. Reproductions of prints done by illustrator, José Guadalupe Posada, including a famous print of a skeletal figure called “La Calavera Catrina” (“The Elegant Skull”), can be easily acquired, with new versions coming out every year. Mexico City, Oaxaca, and Patzcuaro are some of the locations where these items can be purchased. The Huichol or Wixáritari are Native Americans, that design symbolic and very psychedelic folk art based on hallucinations of shamanism and related beliefs, brought on by the use of the peyote cactus. The Huichol express their idea of the spirit world through intricate yarn paintings. Copies of the same designs are also available in commercial craftwork sold in Puerto Vallarta, Guadalajara, and San Miguel de Allende. First rate jewelry made with high quality silver is produced in the mining towns of Taxco, Zacatecas, and San Luis Potosi. Expert silversmiths produce pieces in pre-Columbian and modern designs. It’s advisable to make purchases in a shop instead of the street; the 925 sterling silver mark is evidence of authenticity. Shopping is an event in itself in Latin America and Spain. Traditional markets are filled with fresh fruits, livestock, and homemade baked goods. While markets in Spain have slightly higher-end selections, many Latin America countries offer quality products for a fraction of US prices. Shopping in these local markets is a foodie’s dream. Known as a “tianguis,” this open-air street market is a type of bazaar held on specific days in Central America. In rural areas, you can find traditional items for sale at these markets like agricultural supplies. 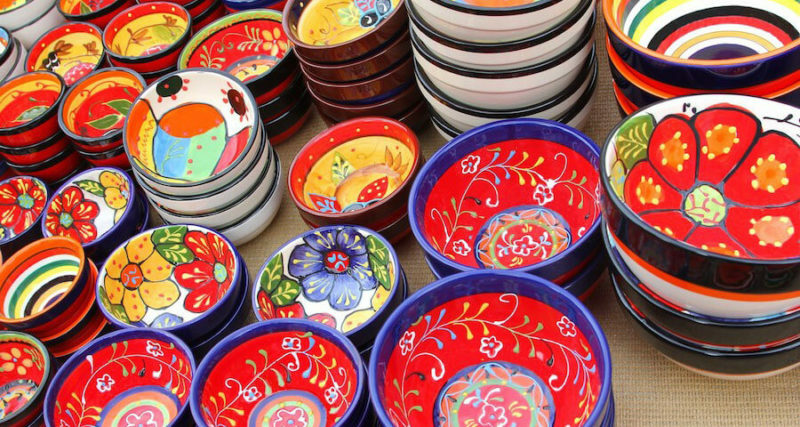 In addition, all tianguis events are host to an array of local and mass-produced products. This is a common shopping destination for groceries, birthday party supplies, clothing, and even children’s toys. Many families even complete all of their shopping at the tianguis. In addition to the open market shopping environment, there are mega-malls equipped with every item a local may need. Shoppers are able to purchase household goods, toys, spiritual paraphernalia, clothing, food, furniture, pets, and piñatas beneath one roof. Small corner stores are also convenient for locals who need to quickly grab a few basic ingredients. Specialty stores host a range of unusual items. For instance, in Mercado de Sonora “witches” sell potions and spells. Unusual specialty meats like crocodile and wild boar can also be found in local markets and specialty stores. Chefs know these locations as a hotspot for unique and unusual ingredients. In fact, visit a high-end restaurant while in Latin America and you may find some of these unusual ingredients on the menu.